Customer is an involved, rational, emotional, experiential person with an intention to buy. We help you with CEM and take control of what this customer experiences across all touch points in the customer journey. Storytelling is without a doubt the sole ‘reason to exist’ for social media. We help with content development that inspires customers to become a part of the conversation. 365-24-7 conversation management is the key to these social stories. Customer’s subconscious mind is the most important influencer of purchase behavior. Retail design is consumed subconsciously. We help you get an understanding of the customer’s subconscious experience across competitive environments. We have a unique study designed to make the customer want to converse and tell us their story/ies vs. responding to a list of items on the discussion guide. We help you choose the story you worth telling believing and the one that will best inspire. 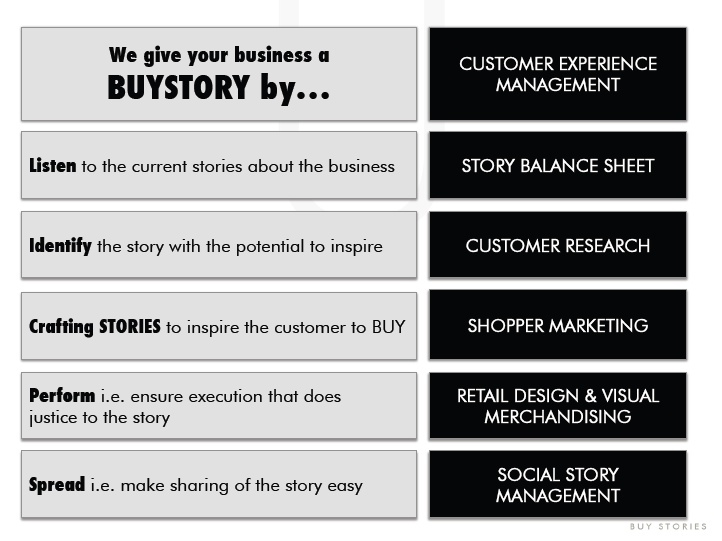 An inspired team will tell stories that the customer will buy into. Created with the objective of opening minds towards the need for CEM in favor of the brand’s long-term goals and sometimes-even sustenance. Designed to put together Customer Experience Council comprising of key experience stakeholders of a brand across the organization.